John started his career in radio as a part-timer at several stations in Raleigh, NC while in high school and college. His first fulltime job took him to Myrtle Beach, SC, where in 1979, he went through the preparations for and coverage of Hurricane David as it raked the Grand Strand. That spurred his interest in severe weather and disaster preparedness. After returning to Raleigh and NC State University, he continued in radio for several years, before becoming a Macintosh consultant, specializing in digital audio and video creation & editing. Becoming an Amateur Radio operator for the specific purpose of joining the National Weather Service Skywarn volunteer program, he was involved in several ‘World’s Firsts’, with the first 24/7 wireless mobile weather webcam in 1999 and the first 24/7 mobile wireless weather station in 2001. From hurricanes, with the help of fellow Ham, Danny Musten, John initiated the first Internet Radio Linking Project (voip) report to the National Hurricane Center, with a portable ham radio from Hurricane Lili, in 2002. He also originated the first EchoLink (voip) hurricane report from a vehicle-based laptop and wireless AirCard, from Hurricane Wilma to the NHC in 2005. He worked as an on-air consultant, with CNN, Fox News, MSNBC and numerous local TV affiliates during hurricane season from 2002-2005 and was the on-camera weather conditions consultant for MSNBC’s coverage of the Space Shuttle’s Return to Flight mission in ’05. In 2007 and 2008 he was Energizer’s national spokesman for their ‘Plan. Prepare. Protect’ initiative, supporting family preparedness education through school and children’s club visits with “The Bunny”, national satellite media tours, appearing in millions of households from the National Hurricane Conference and online content creation. 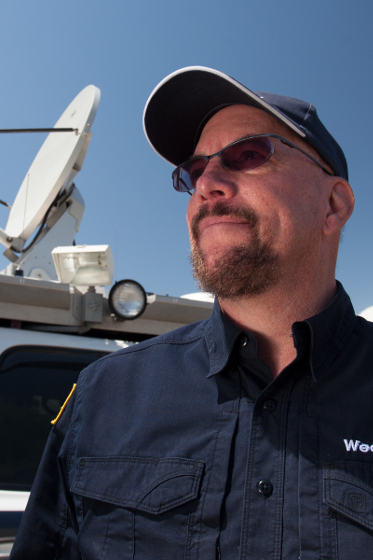 His passion for reporting accurate conditions and preparedness information from the field continues to be an important personal commitment at WeatherNation. My most surprising event was the Thanksgiving weekend F4 tornado in Raleigh in 1988. It formed around 1 in the morning, killed four people and was on the ground for 84 miles! My most memorable storm though, was Hurricane Ivan in 2004. Twelve hours before landfall near Gulf Shores, AL, the storm's surge was already over-topping the dunes and flooding the beach front. Later, surge reached over 15 feet and was still chest-deep a mile and a half inland 12 hours after landfall. I truly saw the power of storm surge firsthand and it was amazing. I'm a tech geek, enjoy Sci Fi movies and lately, I'm a documentary junkie. One of my biggest influences was my Junior High shop teacher, Mr, Maddrey. He was also in charge of the A/V department. So besides learning about just about every technology and 'industrial art' then, I became the "Head A/V assistant" for years, so yeah, I could thread a projector, set up a PA system and rock the school from an early age. I'm an ex-number-one radio morning man AND when I'm not on the air, I sport long, flowing blond hair. I want to continue to use the best technologies possible to gather and disseminate timely and accurate data, advice and warnings to keep the public safer and better informed through every medium available to us.